Hire a lawn service to care for this newly sodded lawn or do it yourself? Hire a professional lawn care service or do it yourself? An important first step is to understand what areas the company will take care of and what areas of lawn care are still the responsibility of the homeowner. If either side doesn't hold up their end of the bargain, the lawn may suffer. There are lawn care companies that can provide an organic program as an alternative to the traditional fertilizer programs. Teamwork is an important concept for both sides. There are few totally complete lawn care services. Some fertilize, control weeds, and possibly insects and diseases, but the homeowner must water, mow, and seed bare areas. Other types of services will mow and rake debris, but not fertilize or control weeds. Watering in most cases is up to the homeowner. Take advantage of the services provided by the lawn care company you have contracted with by working together to get the best lawn for the dollars spent. Another important consideration in any lawn care program is use of quality fertilizers, whether they are organic or synthetic (inorganic). 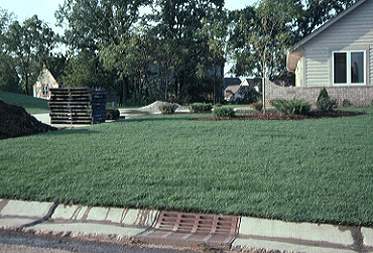 Traditionally fed lawns focus on feeding the grass plant directly. Organic programs focus on feeding the soil organisms and building the soil structure that the grass plant and the soil organisms live in, that in turn then feed the grass plant. Slow-release or controlled-release nitrogen fertilizers are suggested for most application periods using traditional products. These are available in both dry and liquid form, thus just because fertilizers are applied as liquids does not mean they can't be slow-release nitrogen. Although cost is higher, lawns will benefit from controlled-release nitrogen fertilizers, from liquid or dry applications. Organic products release the nutrients for the grass plant continually over time throughout the growing season providing a similar “slow-release” that synthetic slow-release fertilizers do. Most lawn care programs will include a preemergence crabgrass herbicide application in spring and broadleaf weed herbicides either in spring or fall. Insecticide applications should be made only if a serious insect outbreak occurs; rather than being routine. The same holds true for disease control. Lawn care applicators in Illinois are licensed by the Illinois Department of Agriculture to apply pesticides. Seeding, thatch control, and mowing may or may not be offered by a commercial lawn care company. Some firms specialize in a specific service. Organic lawn care companies manage weed control using alternative organic products and focusing on creating a lawn that competes well against annual and perennial weed invasion, limiting the need for major weed control, just like a traditional program, working with the homeowner using proven cultural practices. Regardless of what type of work you are considering having done, it is important to establish clear lines of communication with the firm. They will most likely try to be responsive to reasonable customer requests and needs, but it may be difficult to be totally flexible. Keep in mind maintenance services have a full schedule of customers that may make it difficult to take care of you immediately. Before giving the okay to begin any work, be sure to understand what they will do and what lawn care practices are still up to you. Know what services are included in your contract price and those services that may be extra. Also, what are company policies regarding unsatisfactory jobs? Carefully weigh all the alternatives when making the choice whether to hire or do it yourself. Keep in mind you are purchasing the service as well as the materials, so comparing just the cost of materials alone is misleading. Compare what all is involved, not just the bottom line price. For example, what kinds of fertilizers, organic products, soil amendments and other products are used, how many applications are made, time needed to create your expectations, what are troubleshooting procedures, etc. In most cases, you get what you pay for, whether hiring or doing it yourself.